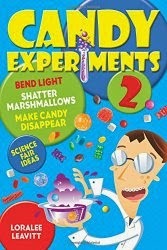 Following the success of Candy Experiments, this new collection presents more ways to destroy store-bought candy. Learn science as you shrink cotton candy, turn brown sugar into white sugar, bend licorice without touching it, make gummi frogs swim, and dissolve eggshells--or teeth--with Warheads. Candy Experiments 2 includes instructions for planning the perfect science project, and highlights experiments that work at school science fairs. The book is written for children between the ages of 7 and 10, though older and younger ages will enjoy it as well. Make giant gummi worms, turn M&Ms into dazzling comets, grow candy crystals, and turn cotton candy into slime! 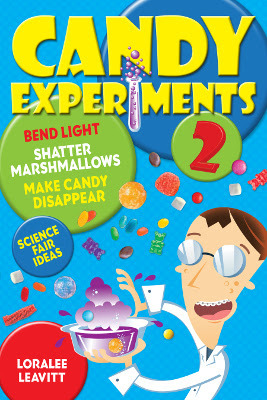 You'll find all these experiments and more, plus simple scientific explanations, in the book Candy Experiments! Candy Experiments, published by Andrews McMeel, shares experiments from the popular website www.candyexperiments.com, as well as experiments that have never been published before. Learn how to separate candy colors, make candy cane stripes in bowls of water, sink marshmallows, and float taffy. Each experiment includes color photos and scientific explanations. Your kids will love experimenting with their candy, and they'll learn something, too! "Both topic and presentation will attract kids with a sweet tooth..."
"When longtime ParentMap contributing writer Loralee Leavitt told me she was publishing a book called Candy Experiments, I made the exact same ecstatic utterance as my 8-year-old son did when I eventually showed him the published book. He read the cover blurb, Blow it up, melt it into bubbling puddles, find secret ingredients, and shouted, "How cool!"..." "Some may think pieces of candy are merely tasty treats, but as author Loralee Leavitt shows in a new book, those sugary items also have the power to teach kids about science and experimenting...."
"Looking for a fun way to introduce science and nutrition concepts to your kids? 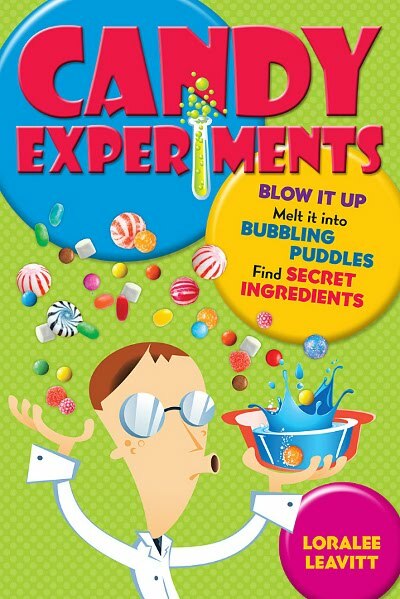 In her new book, Candy Experiments, author Loralee Leavitt shares dozens of brand-new experiments that use candy to teach about these topics...."
"Fun and super easy science experiments for kids to do in the kitchen with their fave ingredient: candy! Find more in the book Candy Experiments by Loralee Leavitt."